So take a little blog tour and discover we are each giving away a gift card worth $25 to some of your favorite stores like Amazon, Paypal, Walmart, Starbucks, Target, and Ulta. How to enter for a chance to win a $25 Home Goods Gift Card! You can also follow me on Twitter. Come back and leave me a comment with your Twitter username. *Please note that each entry needs to be a separate comment and you may only do each task once. Duplicates will be deleted. 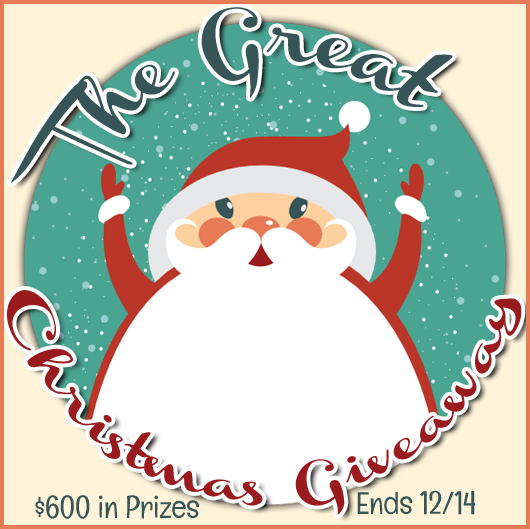 This is a Round Robin Giveaway so each of us will have a link to the next blogger’s giveaway. After you leave me a comment, head over to ErinBrans.com, she is giving away $25 in PayPal Cash! The more blogs you visit – the better chance you have to win. There are 24 blogs total! Good Luck! Fine Print – Winner will be picked by Random.org. Entries will be verified. Open to residents in the US and Canada. Winner will have 48 hours to claim their prize or I will pick a new winner. « 5 Questions to Ask Yourself – Do My Kids Have Too Many Toys?! Our holiday theme is angels and trees. I like the snowflakes idea! If there is a theme it’s old fashioned rustic. Hm, theme? Not sure there will be a theme but so far, burlap and lace with turquoise and green accents. My one room is done in rustic christmas look with plaid and bear, moose and pincones. My other room is done in fun snowmen, lighted hats and a snow village. Ours is mainly Old Fashion Christmas. There is not really a theme, most of the decor is crafts that my girls have made at school. our holiday decor is snowman this year! We don’t really have a theme. We just kinda threw holiday cheer everywhere lol. Lots of color and lights though. Ours is mostly old traditional with many Santas. We don’t really have a theme. A silver and blue tree and a red and green mantle. I don’t have a holiday theme! But I did buy a cute snowman soap dispenser recently :). I also follow you on Twitter (@yesnofilms) and will sign up for your emails. My theme is cupcake Christmas and gingerbread men. I love going overboard on decorations. I have no theme. It is just a collection of everything from over the years from home made ornaments to store bough snow globes!! Our only real home decor theme for the holidays is the colors of deep red and silver although I would like to develop a more solid theme in the future! I signed up for your newsletter and confirmed my email. My theme is kind of hodge podge! Mostly items that my kids have made me over the years! We have lots of stars as our theme right now. We have a Santa/red theme. Not really a theme but we have a color palate-we use gold and silver all over. My holiday decor consists of the treasures the kids have made me over the years, along with a beautiful nativity scene that a great friend gave me. My holiday theme is angels. We don’t really have a theme but we put out a lot of ribbon, ornaments and wreaths! Ours is green wreath theme. We dont have a holiday theme anything goes and as long as there are lots of blinking lights I am happy. My theme is nutcrackers in my house. My theme is snowmen and gingerbread men! We don’t really have a theme unless you want to count eclectic odds and ends a theme. My theme is snowmen. Lots of blue and silver. Primitive–baskets, pinecones, candles, home made primitive snowman, Santas, boughs and lots of scent. Our theme is santas and nutcrackers. I love penguins so I have penguisn everywhere during the winter months! How cool! Our theme is angels and snow/snowflakes! So fun and cozy! I subscribed by email with the email I am signed in with! My decor is chez moi….so, I change it every few tears. I have no real “theme”, I just put out what I like in each particular year. I follow on Twitter (@afbandmom). My holiday decor theme is Santa. I don’t really have a theme, but my style is kind of traditional. I like greens and reds for Christmas, and put out lots of candles. i think my theme is santa hats, i have them on chairs and hanging everywhere. its pretty cute. I suppose our theme is vintage country Christmas. My theme is classical, I guess. We did less of a theme and more of a color scheme. We have lots of greenery up with only red and white accent colors. It’s got a rather old fashioned look to it, but it’s still quite pretty. Ours is animal chic, whatever my eight animals can drag around and shred is the decor! Ours is snowflakes, santos and tinsel. The holiday décor theme in our home is penguins. I suppose my theme would be Christmas chaos. 🙂 It’s a little bit of everything. Ours is Gingerbread men and candy canes. Mine is red and green but in like a country cabin theme with Christmas bears. My theme is traditional with swags and florals. Our Christmas decorations are traditional. Our Christmas theme is snowmen! We do outdoor themes. This year is Snowmen. we are doing snowflakes too. Our holiday theme is snowman & angels! My holiday theme is rustic! We don’t have a theme so, eclectic, I guess. cinnamon is the theme this year! My holiday theme is Hello Kitty Christmas decor! I do not have a theme as much as a color scheme. I like teal, purple and silver more than the traditional Christmas colors. I have a purple and blue theme. Not really a theme but at this time of year I have a pretty good Nutcracker collection! Just lights! You can leave rope lights up all year really! The theme in my home is Winter Wonderland! No central theme for the decorations here. The little ones insist on having a little of everything. We love to have little elves all over the house they are so cute on the trees as well. This year, we went with a snowman theme. Following you via twitter @pw315. The only theme is we have is red and green decorations . Decorated with lots of snowmen this year. Our holiday theme is “who has a nine year old…glitter and glue..on all the things!! Theme? Ha! Mine is just whatever we love and have collected over the years. Is Christmas a theme? I don’t really have a theme. We are pretty traditional. Our Holiday Decor is Red and gold. I love the different ornaments in the two colors and I add a gold ribbon to the tree. We are simple family just a small Christmas tress with ornaments. My family doesn’t really have a theme, but when I get my own place, I want to have a retro Christmas theme. There isn’t a holiday theme in our home because we didn’t put anything up this time. I wouldn’t really call it a theme, just all my Christmas decorations I have lots of candles. There are no decorations here. We don’t have a theme, i signed up for newsletter. This year is mainly greens & blues. Though it wasn’t always, I’ve decorated in shades of purple, burgundy, and metallics (gold, silver, bronze, etc.) for years. The theme in our house is snowmen. Snowflakes sounds like a great idea. Thanks for the giveaway! Snowmen is the theme. So I can leave them out all winter to enjoy! I really have no theme just a collection of things the kids have made and ornaments we have collected over the years! We have no theme, it’s just a little bit of everything! I have a number of ornaments that are nutcrackers and I have the German nutcrackers on a ledge. I also have the red plaid ribbon going about the house. I havent yet kept a decor. Still undecided. My theme is rustic, so a lot of it can stay up for a while. I don’t know if its a motif but we have several red velvet bows up. My holiday decor this year is old fashioned red and green everywhere. Our theme is snow too! Not just flakes — snowmen, snow angels. Hoping to see some real snow this season! I haven’t decorated. We just moved and I am working through the holidays. @W1976Amanda i follow on Twitter. Our theme is Snowman! They are just adorable! Right now, there isn’t one. We always wait until after my daughter’s birthday to decorate. I don’t have a theme other than Christmas. We don’t have a theme, it’s whatever we happen to have. We have no theme. Just a lot of homemade decorations. My theme this year is disney! I am only using colours red, silver and black so it should be interesting! I would love to win ! No theme this year because I am installing flooring . Don’t really have a theme. Lots of lights! I do not have a decor theme in your home, I have 2 handmade wreaths up now and some tree deco outside in the tree in the front yard. I do not have a theme to my holiday decor I have stuff from the 1960s all the way through today! I never really did a theme – just Christmas décor, and then winter décor. My holiday décor theme is butterflies! I love them! Theme? Hodge podge I guess. Old antiques, new kid stuff, and all in between. Our theme is more or less home made Christmas decor. Every year we make something new. You’re suppose to have a theme? My decorations are mismatched but every one has a special and personal memory. I have decorations that are from my great grammie. I do have a soft spot for snowmen. Which is a good thing because I have a lot. I don;t have a theme. Just Christmas tree and lights. No decorations here. We usually travel for Christmas, so we skip the entire decorations. Holiday theme in my house is anything pine! The theme at our house is simple pine and lights. You know, the best parts of Christmas anyway! My theme is every thing christmas. I don’t have a Christmas theme, but if I did, it would be an outdoorsy, Scandinavian winter wonderland….Reindeer, etc. Lights and one snowflake so far. We didn’t decorate at all this year. Not really in the holiday spirit. I had to have surgery and am going to spend the next six weeks recovering. Is it bad to say we don’t really have a theme? Just a bunch of things we’ve collected over the years. I love bright, vintage and kitschy Christmas decorations! My home is decorated with snowmen. All over. The only decorations we are putting up this year is our tree. It is decorated mainly with gold and silver ornaments and white lights. No particular theme in our decorations. I’m not sure it’s a theme but we have red bows everywhere. I’ve never done a theme. It’s always been a mishmash of all the things I’ve collected over the years. I’d love to do a white theme on year though. We did green and red. We have a lot of snowmen so I guess that would be our theme! We have a mixture of holiday decorations. Some of our Christmas ornaments are antiques, some homemade, some new. I don’t really have a theme. I guess it’s minimal traditional Christmas. The holiday decor in my house is gold & bronze. I don’t have a them, just different decorations. My theme this year is Christmas past. I’ve signed up and confirmed my subscription. I don’t decorate for the holidays, so I don’t have a theme to share. I just minimally decorate my house (small tree & mantle lights)…..I am a 4th grade teacher so I decorate my classroom a snow theme. red bows is my theme! Mine is just a small hodpodge of traditional Christmas decor. We have Angel theme in our house. We have a white tree so we decorate with bright colors. Our apartment is pretty small so we just put up the tree for decor. The “theme” in our house is “I don’t think the cats can shred that”. side note: the garland hung over the door ended up not fitting the theme. My theme is a whole lot of everything: Santa’s, reindeer, snowmen, angels. We don’t really have a theme, we don’t decorate for the holidays. The theme in our house is toys everywhere with a few Christmas decorations thrown in for good measure.